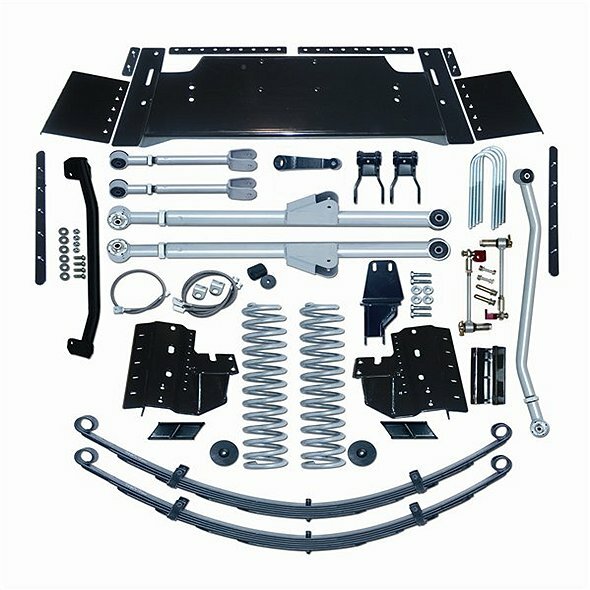 The RE6300 Extreme-Duty™ long arm suspension system provides 5.5 inches of lift and is designed to be a complete suspension replacement that utilizes longer control arms to improved lifted suspension geometry. 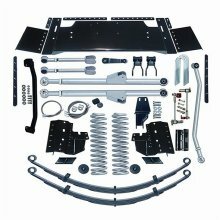 This system will offer you superior stability on and off road, reduced torque roll, axle steer and suspension jacking as well as offering and enhancing traction compared to standard short arm lift kits. The Rubicon XJ long arm suspension system features the innovative RE three-piece belly pan for easy transfer case and transmission access. The kit includes longer front radius arms, and our Extreme-Duty™ upper control arms, both of which feature the renowned RE Super-Flex™ spherical ball joints. This suspension will allow the use of 33 x 12.5 tires. NOTE: When using the stock NP231 or NP242 transfer case, the installation of a slip yoke eliminator and CV driveshaft is recommended. Over 3.5-inches of lift on a full-time NP242 unit may cause unacceptable vibrations on the front driveshaft, when driven in ”part-time” or locked constant use 4WD. RE1345 - COIL SPRINGS XJ-5.5 / ZJ-4. RE1515 - BRAKE LINE SS REAR 18"
RE1550 - BRAKE LINE SET SS FRONT 22"
RE2700 - SHACKLE XJ REAR 5"